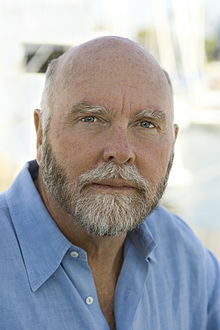 John Craig Venter (born October 14, 1946) is an American biotechnologist and entrepreneur. He was one of the first to sequence the human genome, and led the team which made the first cell with a synthetic genome (2010). Venter founded Celera Genomics, The Institute for Genomic Research and the J. Craig Venter Institute. He now works at his Institute to create synthetic (artificial) biological organisms, and to record genetic diversity in the world's oceans. He was listed on Time magazine's 2007 and 2008 Time 100 list of the most influential people in the world. In 2010, the British magazine New Statesman listed Craig Venter at 14th in the list of "The World's 50 Most Influential Figures 2010". Venter himself recognized his own ADHD behavior in his adolescence, and later found ADHD-linked genes in his own DNA. In media interviews, Venter has several times said he is an atheist. ↑ Shreeve, Jamie (October 31, 2005). "The blueprint Of life". Retrieved December 6, 2007. ↑ "14. Craig Venter - 50 People who matter 2010". New Statesman. Retrieved 21 October 2010.